How to survive the winter in Finland? 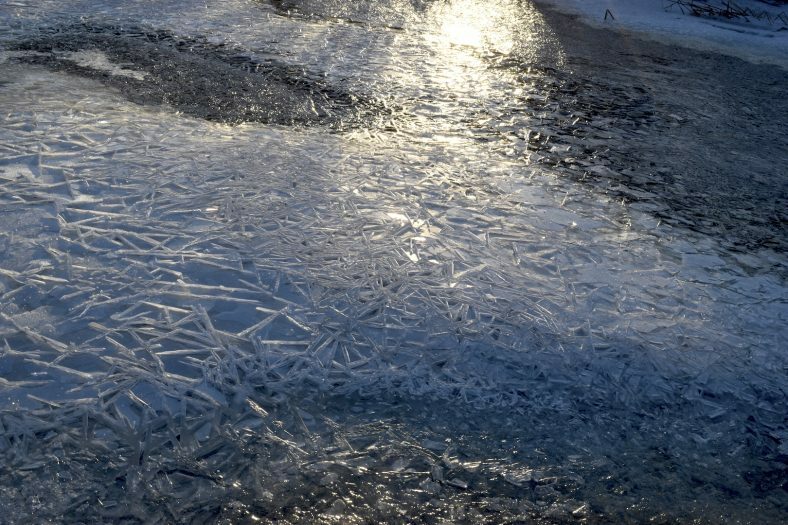 The water is frozen in the winter. All my family and my friends in Taiwan are concerned that I will be freezing into an icicle when the snow season starts in Finland. Well, their concerns are not nonsense, considering that the lowest temperature during the winter time in Taiwan is only about +6°. I thought I would be wearing much more here than what I used to in Taiwan. Actually, not that case. It’s still three layers, but certainly all the clothes are selected to fit the cold climate in Finland. For me, the first layer is the most important one, a fitted long-sleeve T-shirt with quick drying function. The second layer is usually a sweater. The last layer is a proper waterproof winter jacket. In the cold climate, waterproof wear is crucial from head to toe. Helsinki is quite a windy city. The wind can make one feel much colder than the real temperature. These three layers can get me through even -15°. For the international students, if you’re from warm climate, it makes no sense to buy winter clothes in your countries, since the winter conditions are huge difference between your home countries and Finland. For sure, the price in Finland is quite expensive. Thankfully, there are quite some secondhand shops in Helsinki where you can get winter clothes there, most of them are in good condition. I bought my snow pants for 18 euros, which one costs about 300 euros in Taipei. 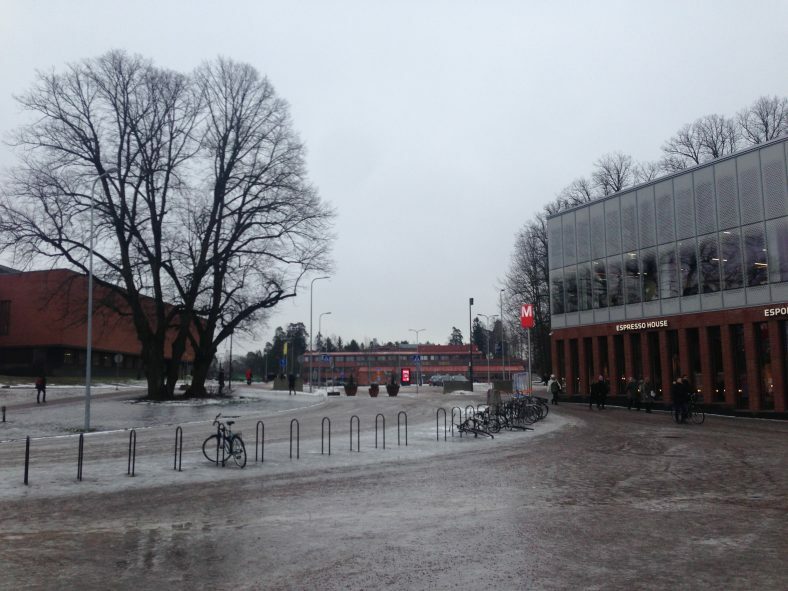 The ground was covered with ice in Otaniemi campus. As for shoes, a proper pair of waterproof winter shoes is a must. It gets quite slippery when the temperature is lingering around 0°. The snow will be melted in the daytime and frozen at night. The whole ground is icy and dangerous. So sprained ankles are common injuries in the winter. Please consider the anti-slippery soles. Also how you walk can reduce the risks of falling, I discover that after I fell several times. I observed how people walked on the snow, they would lean slightly forward and walk in small steps. Just picture an old lady walks, follow that, you will have a higher chance to reach your destination in one piece. Then the scarf, beanie and gloves are must to have as well. Some people will wear another layer under the pants, such as leggings. But according to my Finnish roommates, they never do. It depends how strong your legs are. Every now and then, you just need to get inside to warm up. The winter in Finland is not that tough to survive as long as you dress properly. The snow makes the city look like a fairy tale and bring the possibilities to enjoy a lot of fun winter activities. Hsiao-Pei, Creative Sustainability Master Program. This entry was posted in Life in Finland and tagged finnish winter by Aalto Squad Member. Bookmark the permalink.